The domain within your query sequence starts at position 85 and ends at position 336; the E-value for the RasGEF domain shown below is 1e-7. 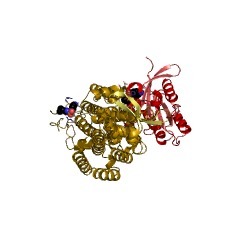 Ras proteins are membrane-associated molecular switches that bind GTP and GDP and slowly hydrolyze GTP to GDP [(PUBMED:1898771)] in fundamental events such as signal transduction, cytoskeleton dynamics and intracellular trafficking. The balance between the GTP bound (active) and GDP bound (inactive) states is regulated by the opposite action of proteins activating the GTPase activity and that of proteins which promote the loss of bound GDP and the uptake of fresh GTP [(PUBMED:8259209), (PUBMED:15335949)]. 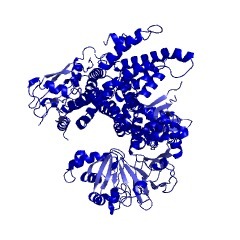 The latter proteins are known as guanine-nucleotide exchange (or releasing) factors (GEFs or GRFs) (or also as guanine-nucleotide dissociation stimulators (GDSs)). 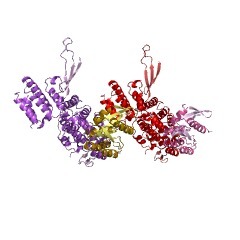 GEFs catalyze the dissociation of GDP from the inactive GTP-binding proteins. GTP can then bind and induce structural changes that allow interaction with effectors [(PUBMED:9438849),(PUBMED:7786285)]. 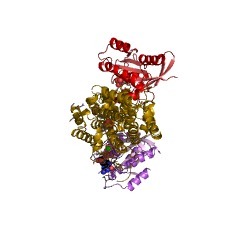 The crystal structure of the GEF region of human Sos1 complexes with Ras has been solved [(PUBMED:8094051)]. 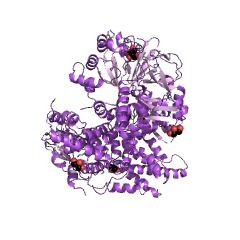 The structure consists of two distinct alpha helical structural domains: the N-terminal domain which seems to have a purely structural role and the C-terminal domain which is sufficient for catalytic activity and contains all residues that interact with Ras. 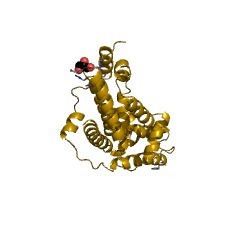 A main feature of the catalytic domain is the protrusion of a helical hairpin important for the nucleotide-exchange mechanism. The N-terminal domain is likely to be important for the stability and correct placement of the hairpin structure. Son of sevenless (gene sos) from Drosophila and mammals. p140-RAS GRF (cdc25Mm) from mammals. This protein possesses both a domain belonging to the CDC25 family and one belonging to the CDC24 family. Bud5 from yeast, that may interact with the ras-like protein RSR1/BUD1. Lte1 from yeast, whose target protein is not yet known. ralGDS from mammals, which interacts with the ras-like proteins ralA and ralB [(PUBMED:8094051)]. This entry represents the catalytic domain of the Ras guanine-nucleotide exchange factors. There are 18332 RasGEF domains in 18317 proteins in SMART's nrdb database. Taxonomic distribution of proteins containing RasGEF domain. This tree includes only several representative species. The complete taxonomic breakdown of all proteins with RasGEF domain is also avaliable. Click on the protein counts, or double click on taxonomic names to display all proteins containing RasGEF domain in the selected taxonomic class. Coupling of Ras and Rac guanosine triphosphatases through the Ras exchanger Sos. The Son of Sevenless (Sos) proteins control receptor-mediated activation of Ras by catalyzing the exchange of guanosine diphosphate for guanosine triphosphate on Ras. The NH2-terminal region of Sos contains a Dbl homology (DH) domain in tandem with a pleckstrin homology (PH) domain. In COS-1 cells, the DH domain of Sos stimulated guanine nucleotide exchange on Rac but not Cdc42 in vitro and in vivo. The tandem DH-PH domain of Sos (DH-PH-Sos) was defective in Rac activation but regained Rac stimulating activity when it was coexpressed with activated Ras. Ras-mediated activation of DH-PH-Sos did not require activation of mitogen-activated protein kinase but it was dependent on activation of phosphoinositide 3-kinase. These results reveal a potential mechanism for coupling of Ras and Rac signaling pathways. GEFs, GAPs, GDIs and effectors: taking a closer (3D) look at the regulation of Ras-related GTP-binding proteins. Cell biology depends on the interactions of macromolecules, such as protein-DNA, protein-protein or protein-nucleotide interactions. 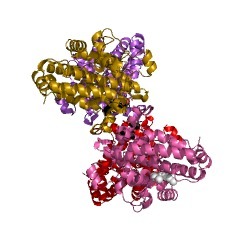 GTP-binding proteins are no exception to the rule. They regulate cellular processes as diverse as protein biosynthesis and intracellular membrane trafficking. Recently, a large number of genes encoding GTP-binding proteins and the proteins that interact with these molecular switches have been cloned and expressed. The 3D structures of some of these have also been elucidated. p21Ras activation by the guanine nucleotide exchange factor Sos, requires the Sos/Grb2 interaction and a second ligand-dependent signal involving the Sos N-terminus. 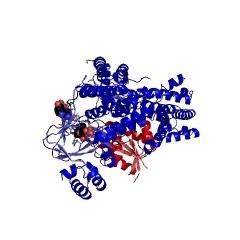 It has been suggested that a key event in growth factor-induced p21Ras activation by the guanine nucleotide exchange factor Sos, is the recruitment of Sos to the plasma membrane by its interaction with the adaptor protein Grb2. However, other evidence argues that the sub cellular localisation of Sos is independent of Grb2, and that the Sos/Grb2 interaction can be dispensed with for p21Ras activation. To clarify the role of the Sos/Grb2 interaction in ligand-stimulated p21Ras activation, we have utilised the observation that overexpression of the Sos C-terminal domain can effectively inhibit p21Ras-dependent signalling in three different mammalian systems. We have shown that concurrent expression of Grb2, but not SH2 or SH3 domain mutants of Grb2, or the alternative adaptor protein Nck, can rescue this inhibitory effect of the C-terminus. This shows that the Grb2/Sos interaction is required to mediate growth factor-dependent activation of p21Ras, and requires the presence of intact SH2 and SH3 domains of Grb2. This approach was also used for a functional analysis of Sos which revealed that growth factor dependent signals are transmitted through both the N-terminal and C-terminal domains. 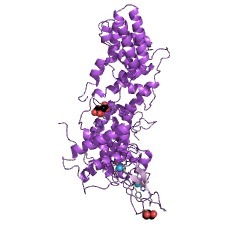 Guanine nucleotide exchange factors: activators of the Ras superfamily of proteins. Ras proteins function as critical relay switches that regulate diverse signaling pathways between cell surface receptors and the nucleus. Over the past 2-3 years researchers have identified many components of these pathways that mediate Ras activation and effector function. Among these proteins are several guanine nucleotide exchange factors (GEFs), which are responsible for directly interacting with and activating Ras in response to extracellular stimuli. Analogous GEFs regulate Ras-related proteins that serve other diverse cellular functions. In particular, a growing family of proteins (Dbl homology proteins) has recently been identified, which may function as GEFs for the Rho family of Ras-related proteins. This review summarizes our current knowledge of the structure, biochemistry and biology of Ras and Rho family GEFs. Additionally, we describe mechanisms of GEF activation of Ras in signal transduction and address the potential that deregulated GEFs might contribute to malignant transformation through chronic Ras protein activation. 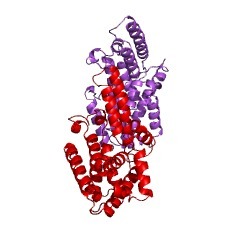 Proteins regulating Ras and its relatives. GTPases of the Ras superfamily regulate many aspects of cell growth, differentiation and action. Their functions depend on their ability to alternate between inactive and active forms, and on their cellular localization. Numerous proteins affecting the GTPase activity, nucleotide exchange rates and membrane localization of Ras superfamily members have now been identified. Many of these proteins are much larger and more complex than their targets, containing multiple domains capable of interacting with an intricate network of cellular enzymes and structures. 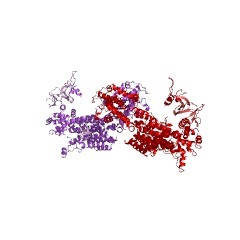 Guanine-nucleotide-releasing factor hSos1 binds to Grb2 and links receptor tyrosine kinases to Ras signalling. 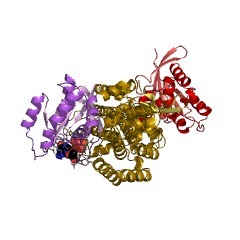 Many of the actions of receptor tyrosine kinases are mediated by the protein Ras, including the activation of various downstream serine/threonine kinases and the stimulation of growth and differentiation. 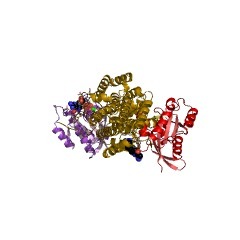 The human protein Grb2 binds to ligand-activated growth factor receptors and downstream effector proteins through its Src-homology (SH) domains SH2 and SH3, respectively, and like its homologue from Caenorhabditis elegans, Sem-5, apparently forms part of a highly conserved pathway by which these receptors can control Ras activity. Here we show that the SH3 domains of Grb2 bind to the carboxy-terminal part of hSos1, the human homologue of the Drosophila guanine-nucleotide-releasing factor for Ras, which is essential for control of Ras activity by epidermal growth factor receptor and sevenless. 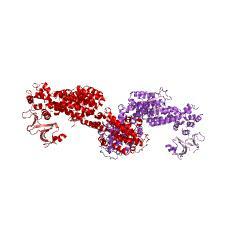 Moreover, a synthetic 10-amino-acid peptide containing the sequence PPVPPR specifically blocks the interaction. These results indicate that the Grb2/hSos1 complex couples activated EGF receptor to Ras signalling. 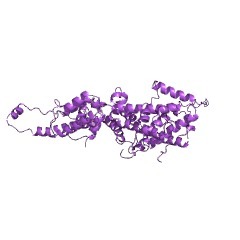 The function of GRB2 in linking the insulin receptor to Ras signaling pathways. Insulin-induced activation of extracellular signal-regulated kinases [ERKs, also known as mitogen-activated protein (MAP) kinases] is mediated by Ras. Insulin activates Ras primarily by increasing the rate of guanine nucleotide-releasing activity. Here, we show that insulin-induced activation of ERKs was enhanced by stable overexpression of growth factor receptor-bound protein 2 (GRB2) but not by overexpression of GRB2 proteins with point mutations in the Src homology 2 and 3 domains. Moreover, a dominant negative form of Ras (with Ser17 substituted with Asn) blocked insulin-induced activation of ERKs in cells that overexpressed GRB2. GRB2 overexpression led to increased formation of a complex between the guanine nucleotide-releasing factor Sos (the product of the mammalian homolog of son of sevenless gene) and GRB2. 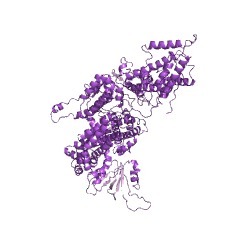 In response to insulin stimulation, this complex bound to tyrosine-phosphorylated IRS-1 (insulin receptor substrate-1) and Shc. In contrast to the activated epidermal growth factor receptor that binds the GRB2-Sos complex directly, activation of the insulin receptor results in the interaction of GRB2-Sos with IRS-1 and Shc, thus linking the insulin receptor to Ras signaling pathways. Molecular cloning of cDNAs encoding a guanine-nucleotide-releasing factor for Ras p21. The stimulation of a variety of cell surface receptors promotes the accumulation of the active, GTP-bound form of Ras proteins in cells. 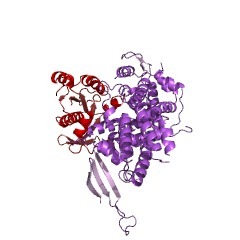 This is a critical step in signal transduction because inhibition of Ras activation by anti-Ras antibodies or dominant inhibitory Ras mutants blocks many of the effects of these receptors on cellular function. 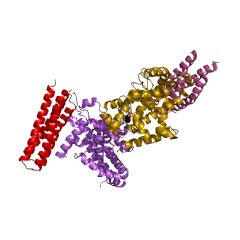 To reach the active GTP-bound state, Ras proteins must first release bound GDP. 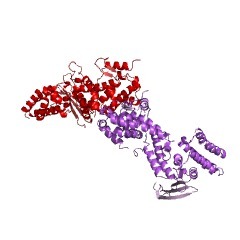 This rate-limiting step in GTP binding is thought to be catalysed by a guanine-nucleotide-releasing factor (GRF). Here we report the cloning of complementary DNAs from a rat brain library that encode a approximately 140K GRF for Ras p21 (p140Ras-GRF). Its carboxy-terminal region is similar to that of CDC25, a GRF for Saccharomyces cerevisiae RAS. This portion of Ras-GRF accelerated the release of GDP from RasH and RasN p21 in vitro, but not from the related RalA, or CDC42Hs GTP-binding proteins. A region in the amino-terminal end of Ras-GRF is similar to both the human breakpoint cluster protein, Bcr, and the dbl oncogene product, a guanine-nucleotide-releasing factor for CDC42Hs. 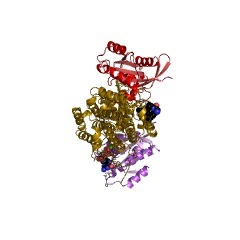 An understanding of Ras-GRF function will enhance our knowledge of the many signal transduction pathways mediated by Ras proteins. Catalysis of guanine nucleotide exchange on the CDC42Hs protein by the dbl oncogene product. 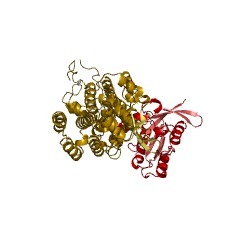 THE superfamily of low molecular mass GTP-binding proteins, for which the ras proteins are prototypes, has been implicated in the regulation of diverse biological activities including protein trafficking, secretion, and cell growth and differentiation. One member of this family, CDC42Hs (originally referred to as Gp or G25K), seems to be the human homologue of the Saccharomyces cerevisiae cell-division-cycle protein, CDC42Sc. A second S. cerevisiae protein, CDC24, which is known from complementation studies to act with CDC42Sc to regulate the development of normal cell shape and the selection of nonrandom budding sites in yeast, contains a region with sequence similarity to the dbl oncogene product. Here we show that dbl specifically catalyses the dissociation of GDP from CDC42Hs and thereby qualifies as a highly selective guanine nucleotide exchange factor for the GTP-binding protein. 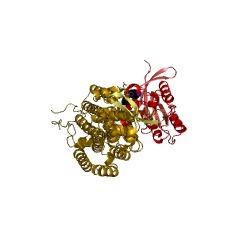 Although guanine nucleotide exchange activities have been previously described for other members of the Ras-related GTP-binding protein family, this is the first demonstration, to our knowledge, of the involvement of a human oncogenic protein in catalysing exchange activity. This information is based on mapping of SMART genomic protein database to KEGG orthologous groups. Percentage points are related to the number of proteins with RasGEF domain which could be assigned to a KEGG orthologous group, and not all proteins containing RasGEF domain. Please note that proteins can be included in multiple pathways, ie. the numbers above will not always add up to 100%. 1xdv Experimentally Phased Structure of Human the Son of Sevenless protein at 4.1 Ang.